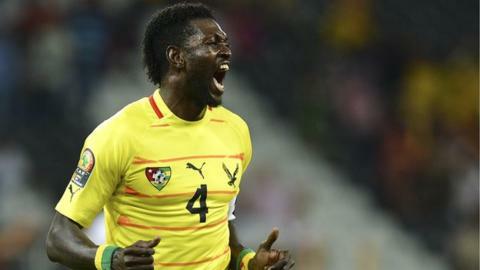 Captain Emmanuel Adebayor described Togo's qualification for their maiden Africa Cup of Nations quarter-finals as a "special moment" for his country. The West Africans drew 1-1 with Tunisia in their final Group D tie to earn a knock-out clash against Burkina Faso. "This is a historic day for my country, my people, my family and for all those who love football in my country," Adebayor told BBC Sport. "It's a special moment - we just have to enjoy it." The Tottenham Hotspur striker, whose participation at the finals in South Africa, was originally in doubt, helped create Togo's goal as he set up Serge Gakpe to open the scoring early on. Tunisia equalised from the penalty spot but Adebayor himself was denied two strong penalty claims, both of which were denied by referee Daniel Bennett whose performance earned widespread criticism. "He had a bad day, but fortunately we found a way out and we're just happy that we're still in (the tournament)," said Togo's talisman, who hit the crossbar late on. Adebayor was only included in Togo's squad after the country's football federation president insisted on his inclusion, with the striker having previously stated that he did not wish to play. He initially expressed fears over security, with the Togo delegation having lost two of its members when attacked by separatists at the 2010 Nations Cup in Angola, before then complaining about match bonuses. The final whistle at the Mbombela Stadium prompted French coach Didier Six to pump both his arms into the air in celebration, before the Togo squad embarked on a lap of honour. Little-fancied to qualify from Group D, the side ranked 77th in the world by world governing body Fifa managed to finish second behind Ivory Coast, but above both Tunisia (53rd) and Algeria (22nd). "Togo showed its quality and its heart. We were a little team in this group, and we have come through to the quarter-finals," Six said. "Today in Lome, there will be a big party." Adebayor was keen to stress that the aftermath of Togo's first qualification - which was achieved at their seventh finals, the first of which came back in 1972 - should be a celebration for the squad. "We have to enjoy this and have a good time as a team," he said. "On Wednesday, we will focus on Burkina Faso. We have to keep working hard to make the story even better." Sunday's clash between the neighbouring countries will produce a surprise semi-finalist, with neither Burkina Faso nor Togo having been expected to make the last four at the continent's leading football event.